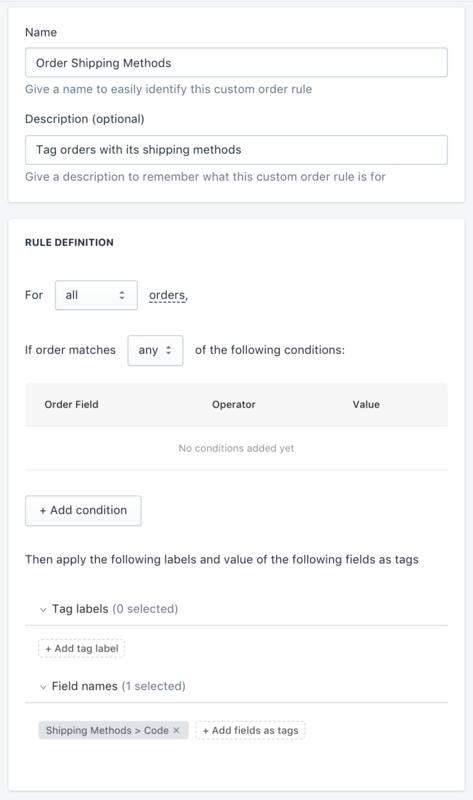 With Smart Tags' Custom Order Rule, you can easily tag orders with the shipping method chosen by the customer at checkout. You can use the value of the Shipping Method Code field as the tag label to be added to the order. Instead of specifying the tag label, specify the field name that you want to use its values as the tag labels. For example, selecting "Shipping Method > Code" will tag the orders with its shipping method code, i.e "Free Shipping", "International Shipping". You may also consider using other fields such as "Shipping Method > Title". Optional: Consider specifying a prefix to be added to the start of the tag label, for example. Learn more about Prefix options.